*Disclaimer: In recent weeks, there have been numerous protests and aggressive behavior from animal rights activists throughout the city in response to chefs serving foie gras. Please note that this blog is of my own personal opinions and taste and I have already stated my opinion on the matter. Harassment in any form will not be tolerated, so please be respectful. Thank you. With that out of the way, our recent dinner at Animal Restaurant was offally good. I have been a huge fan of the superstar team of Jon Shook and Vinny Dotolo for many years now. Following them both at Animal and their more seafood-centric endeavor Son of a Gun. Animal is one of my favorite restaurants in Los Angeles and with the impending foie ban, we’ve been trying to make our way over there as often as our schedules (and wallets) allow. There is a reason why Animal on Fairfax is packed with diners every night. Aside from offering a selection of meaty delights with an accessible gourmet approach, their innovation and strong nose-to-tail philosophy can please any palate willing to open their minds to something new. With California’s aforementioned foie gras ban taking affect in a couple of days, I knew I just had to have some of my favorite dishes including their sinful rendition of biscuits and gravy. Not into foie so much? Not to worry, there isn’t a single thing on this menu that I wouldn’t gladly recommend. We ordered about 6 dishes to share and brought our own bottle of wine (with reasonable corkage). In fear of our arteries, we thought a light bodied Burgundy would do the trick seeing as though we only wanted a simple sipper this time around. Looking back on it, I also think a semi-dry prosecco or dry lambrusco would have been just as tasty. It goes without saying that the service the entire night was spot-on. Courses came out in a timely fashion, our waiter was funny and charming, and the hostesses are warm and prompt. It’s the little things like these that make a good meal great. The order: We started with the Sliced Pig’s Head; beautifully fatty head cheese served with hush puppy croutons and a tart pickled ramp vinaigrette. This dish was a good start to the meal with its brightness and acidity. We then moved on to the Foie Gras Biscuits and Gravy (one of my most favorite foie gras dishes on the planet). Decadent and comforting in every sense of the word, this is the single foie gras dish that I will sorely miss during this ridiculous ban. In an ideal world, the Animal boys will serve it anyway (Chicago Foie Ban style), but it is too soon to tell. The perfectly seared foie on top of maple sausage gravy and a fluffy homemade biscuit just about makes me want to weep. For our third and fourth courses, we went for their Pork Belly Sliders and the Chicken Fried Sweetbreads. The two small sliders were filled with a nicely-sized chunk of tender char sui-style barbecue pork and just the right amount of fresh slaw on a soft brioche bun– nothing out of the ordinary, but seriously good. The sweetbreads, while the least memorable out of the bunch, were perfectly breaded and fried to a crisp; served with grilled romaine and a crawfish xo sauce. If you’re afraid of trying offal, these are a good start– they’re more like popcorn chicken than anything else. Our fifth and sixth courses were definitely the heavier ones of the meal. The Braised Oxtail Poutine with Cheddar was phenomenal. In fact, this simple but satisfying dish puts many other poutine dishes to shame. If only this was served in every bar in town. Lastly, one of the most controversial foie gras dishes in town, the Foie Gras Loco Moco (pictured at the top of this post). On paper, it may seem like a terrible idea, but believe you me, it’s delicious. 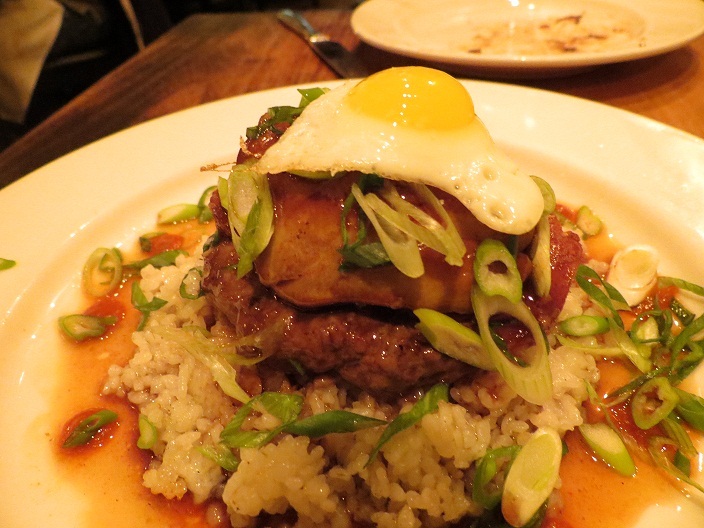 A fried quail egg on top of seared foie gras on top of a hamburger patty on top of a slice of Spam (yes,that Spam),on top of white rice within a bed of au jus and scallions. Indulgent, although the biscuits and gravy are still number one with me. As we made our attempt to stay awake during our post-dinner food coma, we decided to skip dessert and head to the bar for a digestif instead. There’s no telling how long this ban will last, or if it will even be enforced, but I’m at least glad that we were able to come in for one last hurrah. Good thing they’ve got a menu to keep us coming back– foie or no foie.